The global lithium market was valued at US$ 2,983.59 Mn in 2017 and is anticipated to expand at a CAGR of 10.7% from 2018 to 2026, according to a new report titled ‘Lithium Market: Global Industry Analysis, Size, Share, Growth, Trends, and Forecast, 2018–2026,’ published by Transparency Market Research (TMR). The global lithium market is driven by rise in the demand for electric vehicles. Asia Pacific accounts for a major share of the global lithium market. Increase in sales of electric vehicles including hybrid electric vehicles (HEVs), plug-in hybrid electric vehicles (PHEVs) and pure battery electric vehicles (BEVs) is anticipated to fuel the demand for lithium batteries and thereby, lithium during the forecast period. Low weight and high energy density are major properties of lithium responsible for its use in battery applications. Increase in government funding for research and development activities for energy storage applications is likely to augment the demand for lithium in the next few years. The U.S. government has granted US$ 2 Bn to accelerate the development and manufacture of next-generation electric vehicles. 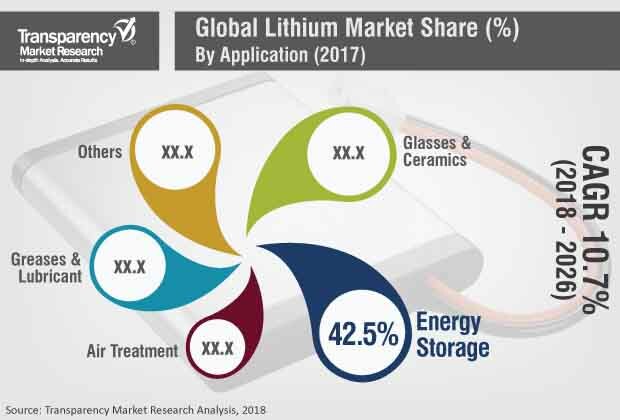 Increasing use of lithium in mobile phones, cordless power tools, laptops, and high-tech devices is anticipated to drive the global lithium market during the forecast period. Use of lithium in air treatment applications such as cooling, dehumidification, and air regeneration is on the rise. Rising use of absorption chillers in hospitals, shopping malls, and other institutional facilities is likely to drive the global lithium market in the near future, as lithium bromide is primarily used in these applications. Increasing use of lithium chloride for dehumidification is another factor driving the lithium market. Gelatin manufacturers, pharmaceutical companies, breweries, and hospitals employ typical installations wherein lithium is used for the dehumidification purpose. Demand for lithium for use in air regeneration is also increasing. Lithium is used for removal of carbon dioxide in space vehicles, sub-marines, miners, and safety devices. Benefits such as small size, low weight, high power, long life cycle, and high voltages are propelling the demand for lithium for use in medical device applications. Alkyl lithium chemicals are used as synthetic agents in the manufacture of organic intermediates for drugs and agricultural chemicals. Use of lithium in the treatment of bipolar disorder is also on the rise. Lithium salts are helpful in mental disorders such as schizoaffective disorder and cyclic major depression. Primary lithium batteries have been used for implantable devices such as cardiac pacemakers, drug pumps, neurostimulators, and cardiac defibrillators. Lithium carbonate is the lithium salt of carbonate used widely in the processing of metal oxides. Lithium carbonate can be used for production of both battery-grade and technical-grade applications. Demand for lithium carbonate for use in lithium batteries is surging, due to its high specific capacity and power density. Lithium carbonate is the first compound in the production chain of Lithium. It is considered a building block for other lithium derivatives. In terms of consumption, Asia Pacific accounted for a major share of the global lithium market in 2017. Asia Pacific has emerged as a hub for manufacture and exports of chemicals and materials over the last few years, with significant consumption of lithium being witnessed by China and South Korea. This has prompted various world-leading companies to strengthen their position in the market in Asia Pacific. Manufacturers such as SQM, Albermarle Corporation, FMC Corporation, and Talison Lithium are leading players operating in the global lithium market. Key players profiled in the report include SQM, Albermarle Corporation, FMC Corporation, Talison Lithium, Tianqi Lithium Corporation, Jiangxi Gangfeng Lithium, Orocorbe Limited Pty Ltd, and Neometals. Manufacturers’ strategy of expansion in developing economies is likely to strengthen their business operations as well as their position in the global lithium market in the next few years. Several manufacturers are engaged in the production of lithium in order to meet the demand from applications such as energy storage, glasses & ceramics, and greases & lubricants.